“A spoonful of sugar helps the medicine go down... in the most delightful way!” croons Mary Poppins (Julie Andrews) in the delightful 1964 film that bears her name. Mary Poppins probably wasn’t the agent of some subliminal marketing ploy aimed at hooking tots on sugar, but her little ditty helps kids take their medicine by coating it in a friendly delivery. Fed Up, on the other hand, gives audiences their medicine with a healthy dose of fire and brimstone as it takes aim at the food industry and wags its finger at fat Americans. Fed Up fails to heed to good advice of Madame Poppins and the result is bitter medicine. The root of America’s obesity epidemic, Fed Up says, lies in all the hidden sugar that’s been added to food products over the past few decades. Something seems off in this angry film that clearly aspires to prompt viewers to take to the streets like Howard Beale, but there’s nothing new in the information, nor anything inspiring in the delivery, so Fed Up isn’t likely to deter audiences from finishing their two-litre pop whilst they exit the theatre. No spoonful of sugar leaves the medicine untouched. Director Stephanie Soechtig certainly makes a tightly constructed argument that America’s obesity epidemic is a disaster with deep roots. Fed Up posits that many products offering healthy alternatives, such as low calorie or reduced fat options, are just as bad for eaters as are options of full fattiness and flavour. The added sugar the industry uses to subsidize the palatability of these food things creates a larger problem, for dieters assume they’re eating healthy when in fact their diet essentially remains unchanged. The argument offers statistics, talking heads, and snazzy visuals to further its persuasiveness. Processed food is bad and kids are fatter than ever. Fed Up, however, doesn’t really add to the roster of documentaries that have already tackled the systemic backwardness of America’s food industry. 2008’s Food, Inc., for example, creates a far more compelling and intuitive analysis of the troubling fact that America makes it far easier and far cheaper to eat an unhealthy diet than a healthy one. The questions of unhealthy lunches at American schools, likewise, receive a much better investigation in last year’s A Place at the Table, which itself struggles to shake a stale flavour. It doesn’t help, either, that many of these food docs feature the same experts offering the same advice. The facts and figures of Fed Up are relatively common knowledge to informed people, although the odd tidbit tossed about in the film might prove enlightening. Fed Up also spends far too much time lecturing the audience and pointing the finger at Corporate America than it does offering alternatives and ideas for healthy options. 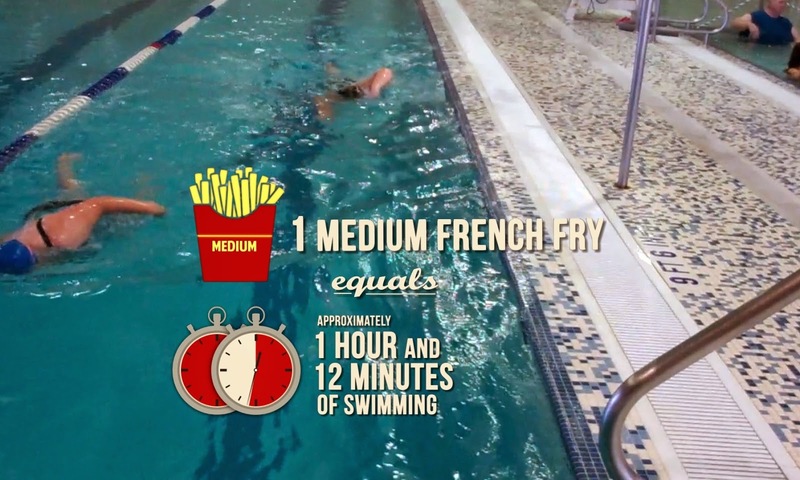 The ending of the film tacks on some simple solutions, but the majority of the film highlights well-tread subjects such as the unhealthiness of the fast food industry or the saturation of sugar in children’s diets. The film similarly manipulates the role that exercise plays in maintaining a healthy lifestyle. The film puts Michelle Obama and her immaculately sculpted arms in the crosshairs for changing the conversations from food choices to exercise. Her change in tune, while reflective of the problematic incestuousness between corporations and politicians, doesn’t overlook the fact that exercise is just as important to health as smart eating. Fed Up simplifies the argument that one will gain weight if one does not burn the calories one ingests. There is truth to the idea that exercise isn't the whole answer, and the film makes a valid claim that a focus on exercise shifts the blame to the individual, but Fed Up overlooks the fact that exercise plays a role in maintaining a healthy lifestyle that goes beyond balancing the calorie count. Amidst the finger-pointing of Fed Up are select case studies of overweight children that make for awkward examples. The film follows a handful of youths who try to improve their health by making themselves are of the food they eat while increasing their rate of daily exercise. Their stories are punctuated by elements of the greater system that influences the way they eat. There is a greater and perhaps more effective opportunity to be had in interrogating the individuals’ approach to healthy eating, but director Stephanie Soechtig often opts for the emotionally compelling snippets of kids expressing their frustration with their weight. Fed Up doesn’t ask these kids why they choose a cheeseburger and fries for lunch when a healthy option is available (albeit one far less palatable than the greasy offerings that overwhelm high school cafeterias). Similarly, Fed Up presents one mom in a Sophie’s Choice-type dilemma as she tearfully explains how hard it is to choose between her son’s health and her predilection for chocolate bars. The film is emotionally exploitative at every opportunity. Therein lies much of the problem of Fed Up. Soechtig has all the evidence to make a case for healthy eating, but the delivery seems intent on getting audiences riled up to take action. The title alone suggests that Fed Up values emotional reactions over intellectual ones and the difference between the two is akin to the sugar rush one gets while perusing the grocery aisles: it might make for an immediate reaction, but the film is unlikely to encourage the long-term thoughtfulness that brings about tangible change. Fed Up is now playing in theatres. What did you think of Fed Up?